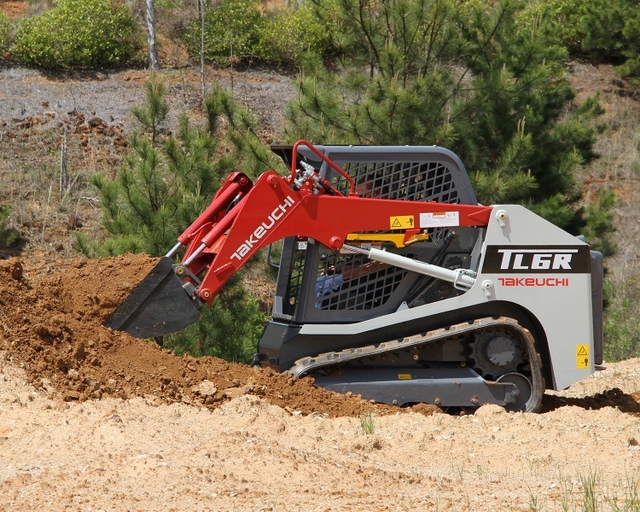 Takeuchi-US, an innovative global leader in compact equipment, has introduced the TL6 compact track loader (CTL) to its lineup. The CTL is an agile, compact machine that is easy to transport, and features outstanding stability and performance. The TL6 is ideal for customers in the agricultural, general contracting, landscaping and rental industries. Powered by a Kubota 2.4-liter, 65.2 horsepower engine, the TL6 features a radial lift loader design with a maximum lift height of 9 feet 6.4 inches, and a rated operating capacity of 1,841 pounds. Additionally, the TL6 has a width of 5 feet and a height of 6 feet 5.8 inches. The compact dimensions of the TL6 enable it to access and work efficiently in areas with limited space. The TL6 features a newly designed cabin with an overhead 5.7-inch color multi-information display and backlit rocker switches that control a variety of machine functions. A cab with a swing-out door, heat, and air conditioner are available for greater operator comfort. The CTL weighs 7,480 pounds with a canopy or 7,780 pounds when equipped with a cab. Takeuchi Fleet Management (TFM) system comes standard on the TL6. The TFM telematics system is available during the machine’s warranty period of two years at no additional cost. It provides a variety of data points including machine health and condition, run time and machine location. The user-friendly TFM system can help reduce downtime, control costs, perform remote diagnostics and schedule maintenance. The TL6 CTL is now available. For more info on Takeuchi, click this link. It’s really very clickable.